A commitment to the future of milk production for the next generation of the Dockeray family has involved investing in new dairy facilities and splitting the farm partnership and Single Farm Payment. Malcolm Dockeray and his brother Nigel invested in a brand new parlour and slurry store to allow a new dairy herd to be set up at Kelsick House Farm, Abbeytown, near Wigton which is now run as a separate business from the nearby Kelsick Farm. Grant aid for capital investment from the NWDA funded programme Farming Connect Cumbria helped divide the 460 acre family farming partnership at Abbeytown to allow better prospects for the next generation. The brothers were farming together and, now each with their own sons, had always planned to establish two separate businesses. Malcolm said: “Our late father John and our mum Phyllis bought Kelsick Farm after moving there as tenants in the 1950s and it had always been Dad’s intention for us each to have a farm. Kelsick House Farm was bought in 1986 and run in the partnership. “Up until after foot and mouth we ran 400 store cattle at Kelsick House, some from the 125 cow dairy herd at the other farm where Nigel and I shared the milking, and the rest bought-in, finishing 100 to 120 a year. With Nigel and his wife Julie’s son Mark, now 24, and Malcolm and his wife Gillian’s son David, 15 and in his last year at Nelson Thomlinson School, fourth generations of the family both keen to continue with dairying, the family decided it was time to divide the business. Malcolm and Gillian also have two daughters, Anna, 17 and Bethany four while Nigel and Julie have a daughter Lisa, 25. By then the Dockerays had already made ongoing investments at Kelsick House, both in land improvement and drainage and in buildings which included a shed with cubicles and pennage for the store cattle which were then made into further cubicles to house the 126 cows. An area between the two new buildings had been left with a view to building a parlour. It was already roofed and just needed to be fitted out with the parlour and concreted. “When we learned about the capital grants available from Farming Connect Cumbria we applied and got the maximum help with both a new parlour and a slurry store,” said Malcolm. Advice was given by business adviser David Baxter and environmental adviser Peter Faulder who both are Cumbria Farm Link advisers. The grant went towards the cost of the Westfalia 12 x 24 swing-over parlour at Kelsick House with milk meters linked to the computer, in-parlour feeders and other time saving extras, installed by GD & M Dunglinson, of Brunstock, Carlisle. In January 2005 the order was placed for the new parlour at Kelsick House and it was commissioned and running by August that year. The Dockerays also installed the exactly same type of parlour at Kelsick Farm which they paid for themselves. This was running by November 2005. Also grant aided was a Permastore slurry tower with 240,000 gallon capacity with the ability to be expanded to a further 160,000 gallons which is important as the farm is in the River Waver catchment sensitive farming initiative which includes Biglands Bog. “Without the grants we would have had to buy second hand equipment and update it later on,” added Malcolm. “It has enabled us to get the herd up and running much faster and it has enabled us to make further investments of our own into super comfort in the cubicles with cow mattresses and keeping the shed clean with automatic scrapers. “The cows are inside half the year and the welfare of the animals is very important. Now we have a situation where the welfare is the best and it also makes it much easier for us. “As a result, our yields from the complete diet have risen since we bought the cows from various breeders from 7,800 litres to 9,600 litres which is about our target. Now we can concentrate on feeding for health. 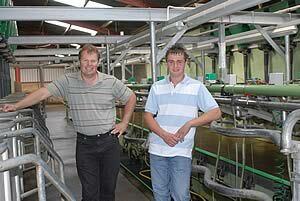 From October 1 milk has been sold to Ronald Akkerman’s West Lakes Dairy. 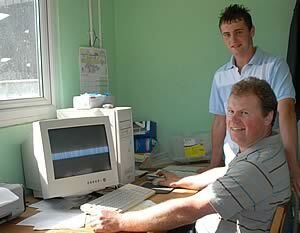 “The investment has left us each with modern facilities on two 200 acre ring-fenced farms, along with rented ground. The original milking parlour has lasted us 35 years and it was still in good working order but the cows were getting too big for the stalls. Now, hopefully, the investment has set us up for the next 30 years. “At the time we made the decision to build another dairy unit people thought we were mad because the milk price was so low, but now it is improving. “It doesn’t matter what business you are in as long as you are willing to work. All sectors of farming get peaks and troughs - you just have to watch what you are doing. It has been tight in dairying. But, like all farmers in this area, we pride ourselves in what we do. Between the two farms there used to be 600 head of livestock. 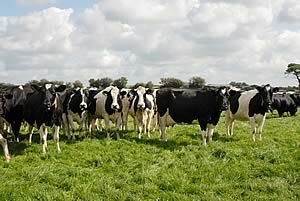 Now there are 120 dairy cows on each farm with 75 followers at Kelsick Farm and 90 at Kelsick House. With the help of the NFU’s Ian Mandle and Glen Davies from the Carlisle office the difficulties of splitting the Single Farm Payment have been resolved. Nigel and Malcolm however still run a contracting business together, forage harvesting and combining, and Malcolm has continued his father’s business selling, fixing and hiring out generators. The brothers have each also invested in a complete diet feeder with the aim of being more efficient however Malcolm does not believe in buying the cheapest but in getting the best price for the best product. His aim is to feed as much as possible of home grown fodder and, as part of the re-seed policy, grass is under-sown with barley which is both whole-cropped and combined. Sheep are taken in over the winter to clean up the grassland. As a result of free advice offered because Kelsick House is in a catchment sensitive area, fertiliser use has been cut to two thirds of what it was originally. Eventually the herd at Kelsick House will be closed but currently replacements are being bought in. All the cows are run with the black and white bull and any not holding to service are then put to the beef bull. Black and white calves are exported and cross-breds are sold store.